Unable to Delete Emails in Microsoft Outlook? 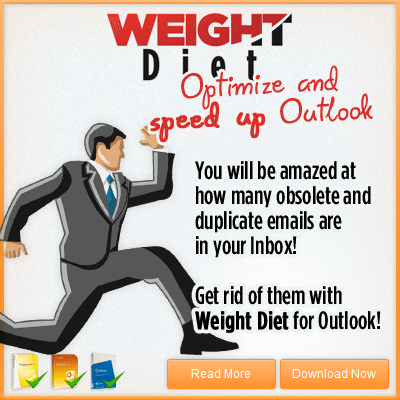 Outlook Add-ins - Email Productivity Tools > Outlook Tips & Tricks > Unable to Delete Emails in Microsoft Outlook? Sometimes, emails can get stuck in your Inbox, Outlook or Sent Items folder and you are not allowed to move or delete them, while Outlook reports an “unknown error”. This article describes various solutions to this problem. If you are unable to delete all emails from a given Outlook folder (not just certain emails), most likely that folder is locked because it is being used by a 3rd party application (for example, it may be scanned by an anti-virus program). Restarting Windows should fix it. If you are unable to delete only some emails (while others get deleted just fine), then your Outlook data file might be corrupted. If you are using Outlook 2003 or 2007, you can check it for errors using the Outlook Detect & Repair / Diagnostics tool available from the Outlook Help menu. Unfortunately, Microsoft removed the Inbox Repair tool from Outlook 2010. – If you are using WBA (Outlook Web Access), there is a known bug in Microsoft Exchange Server version 5.5, when the mailbox storage limit was exceeded. To fix it, your Exchange Server administrator must update to the latest Exchange Service Pack. 2 Responses to Unable to Delete Emails in Microsoft Outlook? Thank you! emptying my deleted items folder did the trick, I was then able to delete the problem email and everything seems back to normal! Thank you ! Hard delete worked.